Information: This set of five postcards reprints some popular earlier issues. The cards were packaged in a resealable plastic bag. 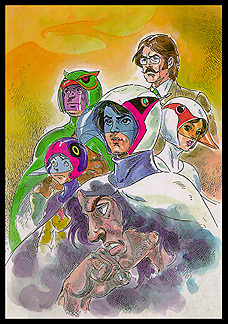 Only one "Gatchaman" card was reprinted, the very first one in the series from 1988. This time around though, it was printed on glossy stock paper instead of its original matte. To see the original, click here. It was illustrated by Sadao Miyamoto.